Wisdom of Life. : My philosphy of life starts from vapour. Life is just like the creation of vapour in gas phase from the open sky. As it settle down, i lay as to form myself as the morning's dew sitting gently on the tree leaves on top of the mountain forest. The constant blow of wind, pushes me down to the tiny stream below where i meet more of my types, the misty dew of early lives. As i start to learn to swim along this icing cold stream, i ponder where my destiny might end. From this small stream, i am channelled into a river which flows faster and stronger. Some of us are diverted to side distribution, the canals and lakes which serve different purposes of life. I am delighted myself because i could see so much as i gather my force as i drift along the bigger river. By the distance i pound over the rapid river, i reach the delta where the water is a little salty now. At the delta of the river mouth, i give the opportunities for people by the hundreds to live and survive. There are farmers and fishermen who make a living in this rich area of the delta. The little vapour gas of me, has developed into a larger dimension to serve the surrounding here. Not just happy and contented over at The Delta, i push myself further to reach the open sea where i have to face the waves and the oceans. Some of them ask, why do i need to go out to the unknown towards the sea. Yes! I am courageous to go, is because out there in the sea is where i control the Seven Oceans of the world. This is where the power and greatness of earth mass is. 90% of our planet is water and without these Seven Oceans life on earth won't exist. Reaching out into the open sea, and by the natural process, i am once again evaporated into the atmosphere. 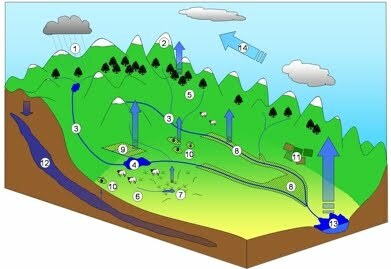 In theory; Water is transferred from the surface to the atmosphere through evaporation, the process by which water changes from a liquid to a gas. As likewise from a gas i could repeat my life cycle again to serve the world. Your posting today is well said & well illustrated. We must have the courage to explore in order to gain more knowledge. Allow me to correct one point here, isn't it that there are only 5 oceans? You are sharp to point the mistake of 5 oceans, Artic, Atlantic, Indian, Pacific & Southern Ocean. BUT you and me make the two extra oceans. Be brave youngman. Okay?